The Landfill Closure and Remediation Program is responsible for overseeing the closure and long term maintenance and monitoring of municipally owned and/or operated landfills as well as overseeing post closure remediation projects to address issues that have developed since the landfill was closed. The Program administers the closure and remediation cost share program, which provides reimbursement to municipalities for eligible closure and remediation projects. The Program also oversees post closure landfill re-use projects, such as solar panel development and recreational fields. Maine has over 400 closed municipally owned and/or operated landfills throughout the State. Most were unlicensed sites that threatened ground and surface water quality because of inappropriate siting, inadequate design or improper operation. In response, the Maine Legislature created the Landfill Closure and Remediation Program (38 MRS §§ 1310-C to 1310-H-1.) in 1988. Its objectives are to promptly close landfills that pose hazards to public health and the environment and to remediate hazards posed by closed municipal solid waste landfills. Although the majority of municipal landfills have closed, several towns are still operating landfills that will require closure within the next few years. The State legislature has extended the date for closure reimbursement eligibility to 2025 to assist with the closure of these eligible landfills. This cost share is currently funded by a disposal fee on construction and demolition debris (“CDD”). In 2015 the legislature extended the year deadline for eligibility for closure costs for landfills that meet certain criteria and enacted a fee on construction and demolition debris (CDD) specifically for the payment of remaining and new State cost share obligation. However, this fee does not currently cover all of the State’s cost share requirements, and municipalities are reimbursed cost share on an installment basis. Payments are made to municipalities on a quarterly basis and reimbursement payments are determined by amount owed to the municipality, with extra priority given to closure, and remediation projects that immediately address human health risks. Remediation is sometimes necessary to abate impacts to the surrounding area or repair failing cover systems. Remediation may include leachate collection and treatment systems, replacement water supplies, extension of public water lines to areas of impacted groundwater, home filtering systems to provide potable water in areas impacted by landfill contamination, gas ventilation systems, slope stabilization for failing cover systems, or gas migration systems to repair damage to covers by landfill gas migration. Many remediation projects are eligible for up to a 90% reimbursement from the Program as part of the State’s cost share. All closure and remediation projects must be pre-approved by the Department in order to be eligible for cost share reimbursement. Please contact landfill closure staff to discuss your closure or remediation project for assistance in determining potential eligibility for cost share. Municipalities are required to maintain and monitor their landfills. 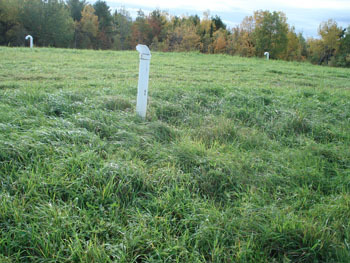 All landfills require annual maintenance to protect the cover system from damage. Maintenance requirements can vary depending on the cover system; however, all require annual mowing to prevent the growth of woody trees that will damage the cover system. Fact sheet outlining the requirements for maintenance. Any operation and maintenance of remedial systems (such as leachate collection systems or residential water treatment systems) are the responsibility of the municipality that operated the landfill. The Program reviews these systems to assure they are operating effectively. Program staff inspect closed landfills on a periodic basis to assure that municipalities are completing required maintenance. Program inspections will be followed up with an inspection report letter to the municipality outlining any deficiencies or issues observed. Environmental monitoring programs (“EMPs”) are required at landfills that are or have the potential to impact water supply wells, nearby adjacent property, or sensitive environments. DEP template for EMP submittals. Department rules, Chapter 401 (5)(B)(5)(a), prohibit the establishment of structures within 100 feet of the solid waste boundary of the landfill. However, the DEP does encourage the re-use of landfills for appropriate development. Examples of approved re-use projects include placement of solar panels, recreational fields, dog parks, and butterfly gardens. Some towns have utilized landfill property for locating sand/Salt sheds. Although the shed cannot be constructed on the landfill, the Program has permitted the construction of a shed within 100 feet of the solid waste boundary if conditions warrant. It should be noted that costs associated with re-use projects are not eligible for any cost share funding from the State. Please contact Program staff to determine if your potential re-use would be allowable and to determine appropriate Department review and approval procedure. Landfills can provide a suitable location for solar panels when cover system construction is appropriate. DEP guidance for solar panel development. Landfills may provide a suitable location for recreational fields. DEP guidance for recreational facilities near closed landfills. The Program has worked with some municipalities to alter their vegetative cover to encourage butterflies and other pollinators. If your municipality is interested in pursuing this, please contact Program staff. The closed landfills under the jurisdiction of the Program are listed in the Division of Remediation's Sites List Database. This is public record of all sites in the Division of Remediation, including Landfill Closure Sites. Additionally, a map showing landfill locations (with all Remediation Sites) is available. This does not include operating landfills, which are overseen by the Solid Waste Landfills, Licensing and Compliance Program. Note: Old abandoned landfill sites that ceased operation prior to 1976 which did not pass through the Landfill Closure Program may not be listed. Please contact the program for information.